Exposure to the fierce elements has left this rugged, untamed wilderness a haven for adventurers. Forge your own trails on the southernmost trek in the world, cruise past icy glaciers that roll peacefully into the sea, let curious penguins waddle up to your feet, or sail the infamous waters at the end of the world. Forests, glaciers, mountains, peat bog, steppe-land, Tierra del Fuego has a lot of different scenery to explore. But of one thing you can be certain, this is a wild and rugged land. Brace yourself against swirling winds, hike through cool rain and mist, find your own path through largely unexplored lands: the trekking here is adventure at its most exciting. There are day hikes from Ushuaia in the Tierra del Fuego National Park, or challenge yourself with a multi-day trek where you'll be wild camping under the stars. Day hiking in Tierra del Fuego from Ushuaia is really easy, there are regular buses that will take you out of town and to the start of trails. The hike to Laguna Esmeralda is one of my favourites. 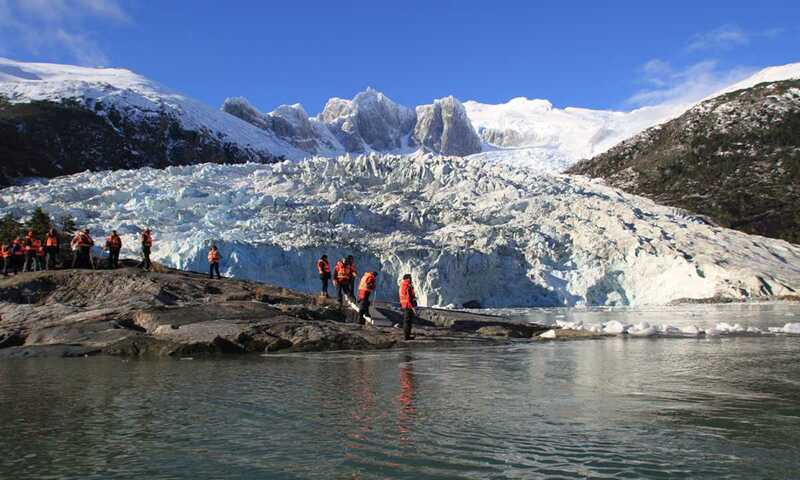 Chilean Tierra del Fuego is a maze of fjords, glaciers and waterways that can only be explored by boat. To get out and about exploring this secluded terrain, join an adventure cruise. You'll sail between highlights, setting out on small zodiac boats each day to explore new parts of the shore or hike up to hidden glaciers. 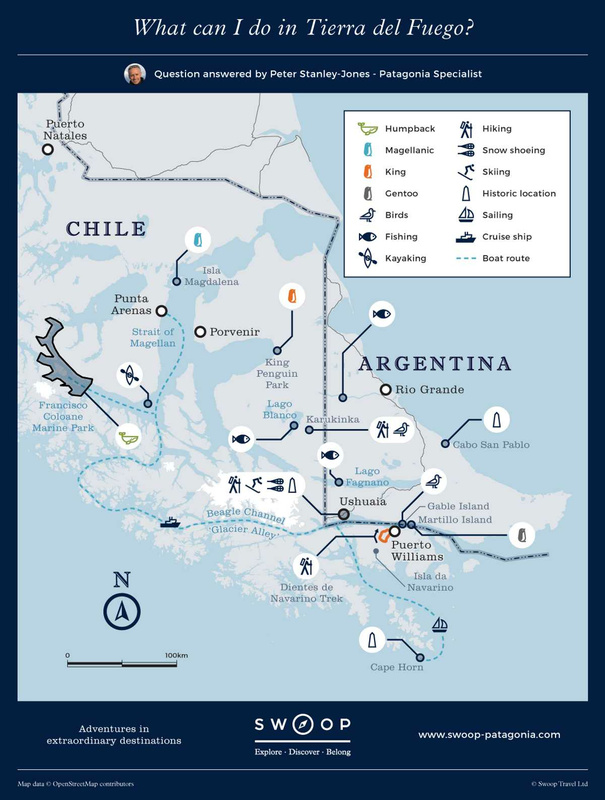 Adventure cruises are also the best way to make the most of your time travelling in Tierra del Fuego - the region is vast, so rather than flying over it or taking an 11-hour bus, cruises will take you direct from Ushuaia to Punta Arenas, and you get to see the best of the scenery and wildlife on the way. In conditions that cause us to layer up and brace against the wind and rain, colonies of penguins and sealions have been thriving happily for thousands of years. Visit them on a short boat trip from Ushuaia, getting so close that the curious penguins will nibble your shoelaces. Just outside of Porvenir, take a trip to see the only colony of King Penguins outside the Antarctic subcontinent. Tierra del Fuego is also a haven for bird-watchers, with a number of waders and waterfowl, along with the chance to see huge colonies of cormorants and maybe the magnificent albatross. Other animals that call this region home are dolphins, guanacos, nandus, and a huge beaver population. With the peat bog valley floor, lakes and surrounding mountains, I have absolutely no regrets whatsoever about going down to Tierra del Fuego. It's all so different to Torres del Paine and El Chalten, it was worth every penny. It is many a sailor's lifetime dream to sail to and in the vicinity of Cape Horn. Follow in the footsteps of Joshua Slocum and other sailing pathfinders: this is an opportunity for anyone with modest sailing experience to test the waters at the end of the earth. Sailing trips take a maximum of four crew members, who join a skipper to sail around the end of the world. On board your 40ft boat, you'll be sleeping in one of two double cabins, sometimes camping on shore depending on the trip. Crew members are expected to have a little sailing experience, but your skipper will be your expert guide, helping you read the conditions and directing you to some of the most impressive hidden gems in this wild landscape. Although the Chilean navy doesn't allow commercial vessels to sail to Cape Horn, you'll be an honorary member of a sailing club for your time there. For some, reaching the end of the world is just the beginning of the adventure, for south of here lies one of the remotest, wildest territories on earth: Antarctica. Almost all voyages to the white continent sail from Ushuaia, travelling across the Drake Passage and exploring the many islands and iceberg filled waters around Antarctica. Adding on Antarctica to your Patagonian adventure requires time and budget, but is a once in a lifetime experience that will never be forgotten. Our polar specialists in our sister company Swoop Antarctica can help you plan the perfect addition to your trip.